Theory of mind is a social cognition skills demonstrated its importance in the last forty years with psychiatric clinical trials. Theory of mind is seen as an effective and necessary skill in the social function-ing of human who is a social creature as the ability to recognize the mental states and emotions of others. In the first six years of life, theory of mind has been associated with many fields. Findings related to many neurobiological bases, such as limbic-paralimbic structures, prefrontal cortex, which start with mirror neurons, help this sense of meaning. 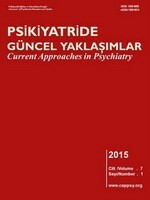 Areas associated with theory of mind development provide better understanding of theory of mind skills and deficits, the first psychopathology studies have been carried out in children with autism, and the studies about theory of mind skills in the diagnosis of neurodevelopmental disorders are becoming more and more interesting. In this review, theory of mind development, neurobiological basis and related areas will be explained and the relation of theory of mind with psychopathology will be examined.